A year after the launch of the original C3-01, the S40 handset is now available in a gold version. 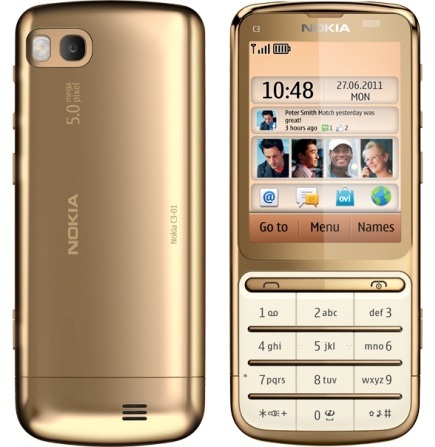 Nokia has launched the gold edition of the handset exclusively for Eastern European and Middle Eastern markets. The luxurious handset has an 18-carat gold plating, ceramic-feel keymat and a matching theme. The handset also has an increased 1GHz processor for an extra oomph of speed. Memory: 30MB internal memory, expandable to 32GB. Battery: BL-5CT 1050 mAh Li-ion battery, 20 hours of music playback, upto 18 days of standby, 5.5 hours of talk time.